Here is a nice little deal for a FREE Movie Ticket. 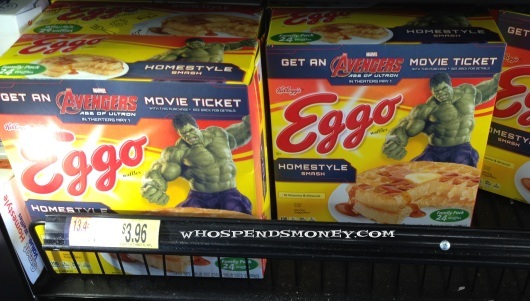 It appears Kellogg’s has started 3 or 4 big promotions around the new Avengers Movie. Of course you do not need to see that movie, and these promotions allow you to watch any movie. But this particular deal is different because this one can only be done at Walmart! 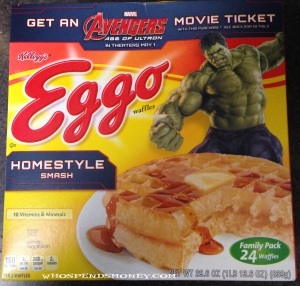 Buy 1 box of 24ct Eggo waffles and get a $10 emovie cash certificate good at basically all theaters towards any movie! 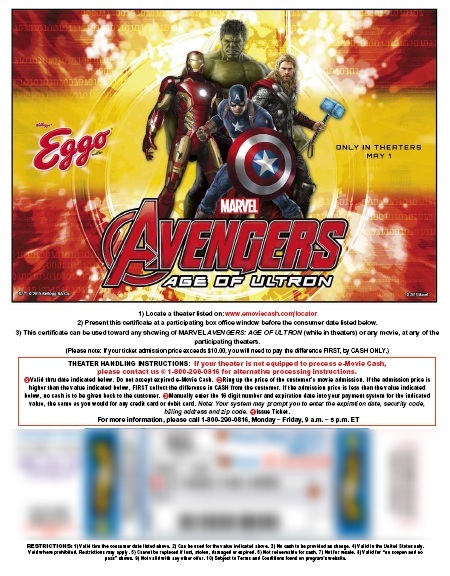 Here is where you get all the details, Kellogg’s Eggo Walmart Avengers promotion. You buy the item, text(or email) a copy of the receipt to “eggo24@drvsusa.com” It took about 20 minutes to get my text back with the Movie code. I went to www.eggo24moviecash.com, and entered the code they texted me. I went through the prompts and I have my shiny certificate for a FREE movie(up to $10) 🙂 Perhaps over the next 3 months we will get a Eggo coupon that everyone will be able to get, because the $1/1 Eggo coupon currently requires 850 Kellogg’s points to get. Final Price=$2.96 after coupon for a BIG box of eggos and a FREE Movie Ticket!